The ADP-3 can be used not only for improving the playback of CD's and the latest digital media sources such as DVD & SACD, but also for analogue vinyl sources. The Adp-3 has been launched to give greater flexibility in use and an enhanced SuperStereo performance. What is it that makes live music instantly recognisable as such and sound so different from 2-channel hi-fi stereo sound? What is it that is missing from stereo? Dynavector have long sought the answers to these fundamental questions and as a result have developed an advanced form of stereo to which Dynavector have given the name "SuperStereo". The unique nature of SuperStereo is based on theoretical and practical studies of sound wave propagation. It is basically different to the technology used in conventional type of sound processors or DSP processing and has been widely and critically acclaimed. The ADP-3 is the culmination of 18 years of research effort by Dynavector into how sound actually behaves in enclosed spaces, as in concert halls and recording studios. 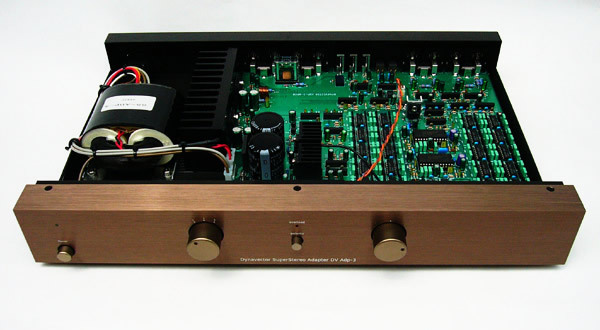 SuperStereo extends further the pioneering work done in the development of sound reproduction. In recent years, intense effort has been made to improve the quality of sound reproduction with the use of different formats such as SACD, DVD (A) and with surround sound. But this effort has resulted mainly in producing sound, which has higher resolution, or, in the case of surround sound, echo type effects where sound of all frequencies is subjected to the same delay. 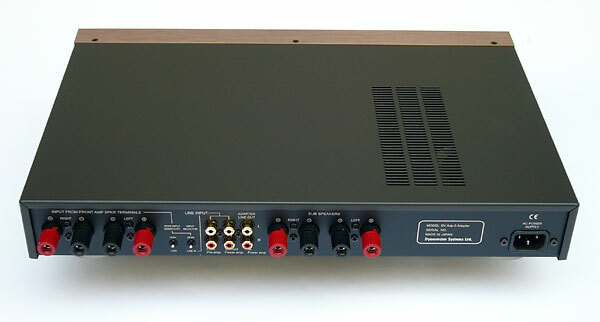 While such surround sound systems may enhance the sound effects from cinema movies and their domestic home cinema counterparts, when used for music reproduction they cannot rival the immediacy and ambience of SuperStereo where analogue, frequency dependent, time delays are used to produce a sound of much greater naturalness. 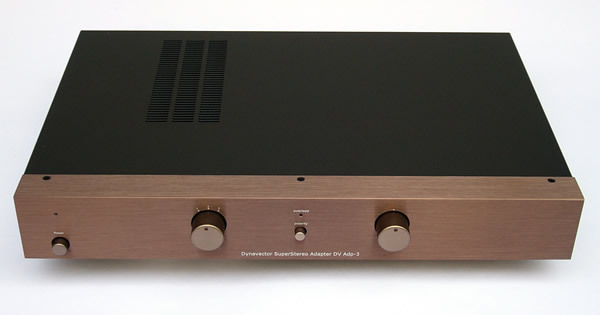 Or, as Paul Messenger, a leading British audio reviewer put it when writing about the DV Adp-2 in Hi-Fi Choice magazine "it is extraordinarily convincing"........"simply sounds more natural and right than regular 2-channel stereo". The reason for SuperStereo's superiority is that it is based on what actually happens to sound waves in real life. The editor of the British hi-fi magzine "Hi-Fi +" Roy Gregory, in reviewing the Adp-2 in the July/August 2002 issue, entitled his article "Why the best surround sound isn't surround sound at all…Or, why Dynavector's DV Adp-2 SuperStereo processor isn't quite what it seems" The innovative nature of the SuperStereo has also been recognised by the granting of patents world-wide. A SuperStereo system can be easily be had by adding the ADP-3 and a pair of small speakers to an existing stereo system. If you already have a spare pair of small speakers, you can use them. The front speakers should be positioned in the normal stereo position. A pair of sub-speakers for use with the ADP-3 should be positioned face-on to the front speakers and a little in front of the listening position. The ADP-3 has been carefully designed to work with high quality audio systems, so if you wish to upgrade any of your other components, there is no need to change the ADP-3. 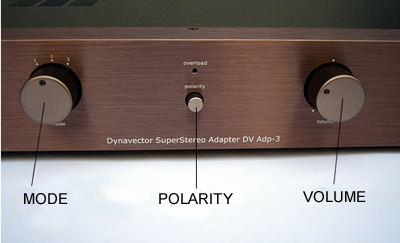 The ADP-3 will also improve the musical quality and enjoyment of mono and old and poorly recorded material. The ADP-3 can be used in large rooms and at high volume where required for events or entertainment purposes. With the ADP-3, the main adjustments can be made from the controls on the front panel. The ADP-3 has a choice of 3 pre-sets offering 3 different SuperStereo sound delay characteristics with easy switching between them to match the acoustic conditions of the recording or broadcast venue and the type of music being played. To maximise the connection options, the ADP-3 can take inputs from the front amplifier speaker outputs, and there are also input sockets for a pre-amplifier output. So it is just as easy to use with a separate pre-amplifier and power main amplifier or mono-blocs as in a system with an integrated amplifier. The ADP-3 is equipped with an internal 24 watts per channel stereo amplifier to drive the sub-speakers so a typical audio system can be transformed into a SuperStereo one simply by adding a pair of small speakers. 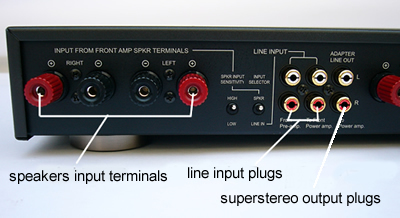 The ADP-3 is also equipped with a processor line output terminal to enable a separate, more powerful amplifier to be used for the sub-speakers if desired. The ADP-3 front panel has been given a high quality finish and the control knobs have been made by a machining process. For sales and demostrations of SuperStereo processors in Europa please contact Dynavector SuperStereo in UK.